These are the most common questions that GSD owners ask. 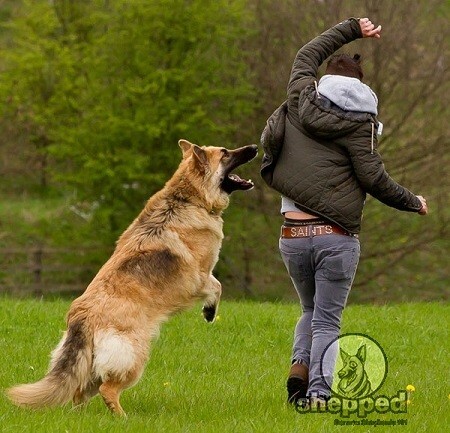 It is very common for a GSD to greet guests by jumping over them. This happens either due to your dog’s overly-excited nature or its overly-possessive/protective nature. Either way, the jumping habit of a GSD can be very rude, threatening, and scary for many people, as German Shepherds are known as strong guard dogs. Does Your GSD Crave Attention? Many times when your GSD is left alone, it gets bored and begins to jump at people to get attention. When guests visit your home, your GSD will feel like it is being neglected. As a reaction to it, it starts to jump on the visitors. The visitors get frightened, and you get angry at your dog. However, reacting to your dog’s jumping in a negative way will only make things worse. GSDs jump on people when they are bored or want some attention. They will try their best to grab everyone’s attention, and mostly they jump over people to get noticed. When your GSD is just a pup, it looks adorable trying to jump on people. However, when your GSD grows old, its jumping habits become irritating and uncontrollable. 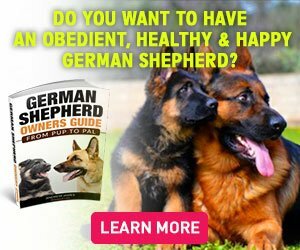 Is Your GSD Protecting You? Another reason that GSDs jump on people is when they see others as a threat to its owner or family. GSDs are loyal dogs that go to any extent to protect their owners. This is a personality trait that they are born with. However, this trait can become a problem when it starts to scare people by jumping on them. The key is to train your GSD to behave and let it socialize with other people starting at a very young age or else people will be frightened to visit your home with a full-grown muscular dog jumping on them. GSD pups use their sense of smell to get to know their environment and the people around them. So, the smells that they recognize are the people that are close to it or live with it. Apart from that, other people are just strangers to it, and it sees them as enemies or threats. Jumping is not a behavior that is liked by many, especially when it comes to strangers. So, to make this behavior stop, you will need to adopt some effective strategies given below. The best way to make that jumping stop is to ignore your dog. A GSD will jump when it needs your attention, and when you don’t give it what it wants, you are indirectly telling it that this is not the way you are going to get attention. Do not give affection or attention to your dog when it is jumping. Another effective way of getting control over your dog’s behavior is to put in on the leash. No one wants to see their dogs jumping on guests and scaring them away. This is a very embarrassing situation and to avoid it, one must use the leash. Put your dog on a small leash when you are expecting guests. This way you will be in control of the way your dog greets other people in the house instead of jumping all over them. Jumping behavior is seen in the dogs that are not trained to follow commands from a young age. If you train your GSD to follow voice and hand signals, it is less likely to jump at every other person. When you have guests home, and your GSD is approaching them, ask it to sit by pointing at the floor with your hand. Your GSD will follow your commands only if it is trained to. Otherwise it will ignore your commands or not understand them at all. Making your dog greet the guests in a sitting position is a good way to putting a stop to jumping. 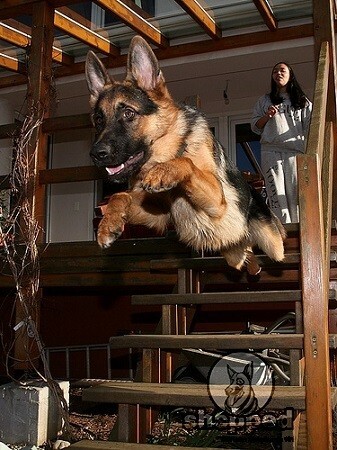 Similarly, you can use commands like ‘stop’, ‘down’, or ‘stay’ to put a stop to your GSD’s jumping behavior. If your GSD jumps at anyone that visits your home, it is best to keep it in a separate room when guests are over. Train your dog to be in a designated spot when someone visits or if that doesn’t work, keep your dog in its room or crate when you have visitors. You cannot train your GSD to remain calm overnight. Behavior training is another way you can make this stop. To know more about GSD behavior training, sign-up on our website and stay up-to-date with everything you need to know about a GSD. If you have any questions to ask or stories to tell, feel free to share it with us.